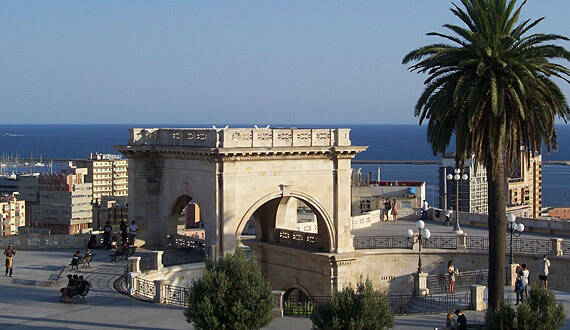 What to see in Cagliari Cagliari is ideally divided into four quarters. Villanova, to the East, is developed at the foot of the castle and today is the commercial heart of Cagliari, dotted with shops and some unmissable monuments, for example the Bonaria Sanctuary. Very characteristic and lively is the Marina quarter, south of the city between the castle and the port, with dark and straight lanes from which the churches of Sant’Agostino and Santo Sepolcro stand out. To the north, contained between the walls, you will find the Castello quarter, the ancient heart of the city, a tangle of lanes with churches and buildings loaded with charm and history. From the monuments to see, there are the two Pisan towers, the cathedral, Palazzo Bovi and the bastion of San Remy. The Stampace quarter is developed in the west zone, today the lively quarter with bistros, bars, cafes and night bars and monuments like the Roman amphitheatre, the San Michele church and the Sant’Efisio and Santa Restituta crypts. The hinterland of Cagliari is spectacular where you can find many reasons for a tour; from nature to archaeology, from history to folklore often retold in small but interesting museums. An unmissable visit is the Natural Regional Park of Sette Fratelli, where dense woods, habited by Sardinian deer, golden eagles and moufflon, which alternate the granite rocks etched by the wind, similar to real sculptures. Worth a stop is the Cervo Sardo museum that collects exhibits examining the Cervus elaphus corsicanus, animals considered at risk of extinction. Also to see is the Natural Regional Park Molentargius-Saline formed by basins of sweet water, salt water for the production of salt, from a plain characteristic by prevailing aridity. Lovers of trekking and nature must not miss an excursion to the Pixina Manna Forest. The pathways of the forest start about three kilometres from the Is Molas golf course and winds between small waterfalls and torrents until Dispensa Tonietti, a refuge mountain where you can stop for a snack based on typical products or until the waterfall on the Montixeddu river. Another fascinating way to explore the zone is by horse riding. The Archaeological area of Nora is considered one of the most important on the island which holds testimony to the Fenic-Punic period and the Roman era.